Camp is the place to make lifelong friendships. To this day, we keep in touch with at least half of our bunk. Bonded together in the wilderness, learning to cooperate, sharing responsibility, and becoming a unit in a bunk during critical early tween and teenage years does something for kids. Now with modern technology, it's easier then ever to keep in touch with camp friends during the rest of the year. Speaking of technology, it's a time to completely unplug. Most camps require campers to check their cell phones. That means no texting, Facebook, Twitter, Instagram, Vine.... you get the point. Whether it's 2 weeks, 4 or 7, a ban on the tech is a chance for kids to get back to reality and to learn to socialize the old fashioned way - talking face to face! Kids move! At camp, your day is blocked out into chunks of activity. From soccer to swimming, archery to the ropes course, kids are on the move. No couch potatoes, video games or T.V. here! For many city kids, camp is a quite respite. (We knew many New Yorkers who had trouble sleeping with the quiet the first few weeks. They missed the busy street noises!) It also allows kids to truly explore nature and feel peace. The independence and responsibility campers learn is incredible. Our parents told us we aged at least 2 years after our first summer. Kids learn to trust their instincts, make good decisions, and build their character. Children will learn to problem solve and that they are responsible for their actions. These are lessons that cannot be taught in the same way by the parents. More Than Paper believes that camp is more than just what you do during June, July or August. Going to camp is an experience that molds kids and gives them lifelong skills. We're excited for this season! 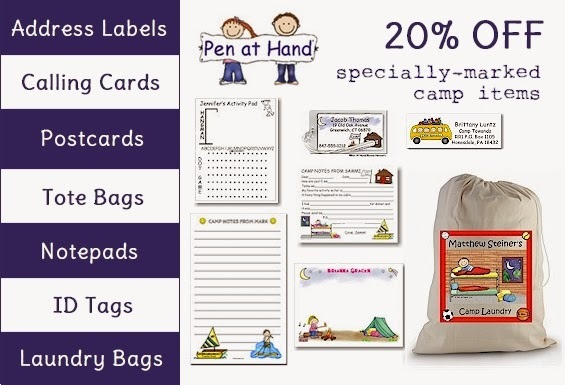 In preparation, we have a sale going on camp products by Pen At Hand. Choose from personalized laundry bags, address label stickers, fill-in bunk notes, stationery, note pads, and more. Click here to see all camp products and here to see all Pen At Hand products on sale. View all Pen At Hand Camp Sale Items Here! Share your camp experiences with us here, or on our Facebook page!